By John Crowley, from a lecture delivered in June at MoMA PS1 as part of Triple Canopy’s Speculations (“The future is ”) series. 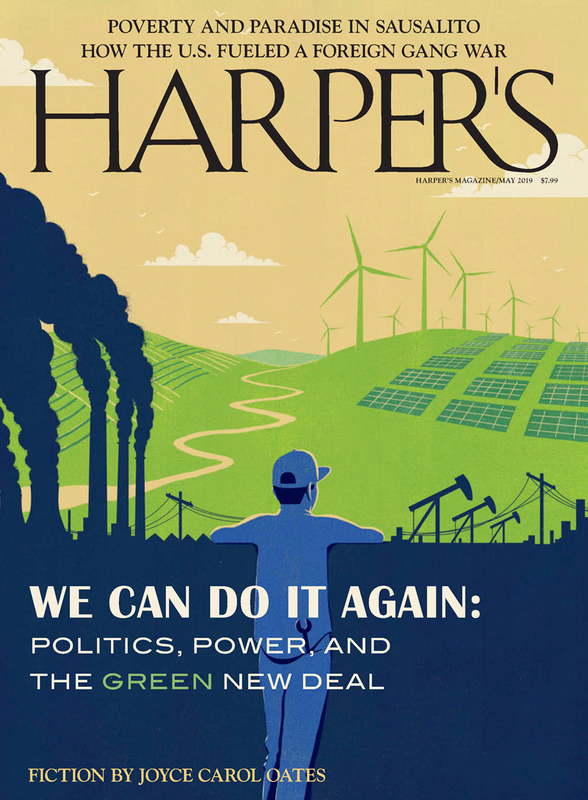 Crowley’s article “Madame and the Masters” appeared in the February 2013 issue of Harper’s Magazine. I am a writer of fiction whose pile of work includes two or three novels and some stories that picture future states of the world or travel through time into the future. None of the futures I’ve pictured are consistent with the others. Sometimes I’ve been asked whether I ever predicted any things that actually came to be, and since a lot of my science fiction was written pretty far in the past, some results are already in, and no, not so many. One: in a story first published nearly forty years ago, I described an insect-size drone capable of following a person and transmitting sound and image that could be archived. I called this thing a Wasp. The one that’s now closest to functioning is called a Bee. The future is a parable, one that the speculator tells to himself; sometimes others are affected by it, though many who are affected by it mistake the parable for a plan or a promise or a vision. The Roman poet Horace, in his satires, tells the story of Tantalus, who is punished in the underworld by unending hunger and thirst. Nearby — but just out of reach — are food and water. He tries to dip his lips into a stream that forever slips away. Quid rides? Horace asks. What’s so funny? De te fabula. The story’s about you. A parable is a story told to you that is about you, or comes to be about you as you ponder it; the great parables can be pondered forever. Here is another. In 1946, as he was conceiving 1984, George Orwell reviewed the writings of an American political philosopher and futurologist named James Burnham, whose work had made a deep impression on him. Burnham began his political life a Trotskyite and went on to become an editor of the National Review. In 1940, he published The Managerial Revolution, which foresaw the coming of a new order in human political and economic organization. Capitalism would soon disappear, but socialism wouldn’t replace it. Instead, Burnham said, a managerial class of bureaucrats and technocrats and administrators was evolving that would replace both the old-fashioned business owner/entrepreneur and electoral politics. Private property would disappear but wouldn’t be replaced by common ownership; the managers would make all decisions, distribute all wealth, retain all power. The rest of humanity would subsist as dependents, happily enough, controlled by propaganda. Meanwhile the clusters of small states, democratic or tyrannical or whatever, would vanish, to be replaced by a few huge combines — America, Europe plus western Asia, the Pacific East, the Soviet sphere. These would be continuously at war, though never able to dominate all the others. A kind of stasis would probably eventuate and last from then on, or at least for a very long time. World War II begins; Burnham’s sympathies are with Germany as long as Germany appears to be winning. He continues to make prophecies throughout the war. Germany and Japan are bound to survive as great states, and to remain the locus of power in their respective areas; the U.S.S.R. is bound to be defeated. When the tide of war turns in 1943, Burnham changes his sympathies, and he begins to talk of Stalin as a superhuman figure — “indeed a species of demigod,” Orwell says. At the war’s end, Britain will basically cease to exist, and Russia and Japan together will establish a vast managerial system in the Far East to match the Nazis in Europe and a new American managerial system primitively shadowed forth in FDR’s New Deal. We are different from the oligarchies of the past in that we know what we are doing. All the others, even those who resembled ourselves, were cowards and hypocrites. The German Nazis and the Russian Communists came very close to us in their methods, but they never had the courage to recognize their own motives. They pretended, perhaps they even believed, that they had seized power unwillingly and for a limited time, and that just around the corner there lay a paradise where human beings would be free and equal. We are not like that. We know that no one ever seizes power with the intention of relinquishing it. . . . Power is not a means; it is an end. The object of persecution is persecution. The object of torture is torture. The object of power is power. Now do you begin to understand me? at each point Burnham is predicting a continuation of the thing that is happening. Now the tendency to do this is not simply a bad habit, like inaccuracy or exaggeration, which one can correct by taking thought. It is a major mental disease, and its roots lie partly in cowardice and partly in the worship of power, which is not fully separable from cowardice. . . . This habit of mind leads also to the belief that things will happen more quickly, completely, and catastrophically than they ever do in practice. . . . The slowness of historical change, the fact that any epoch always contains a great deal of the last epoch, is never sufficiently allowed for. This applies, by the way, to our current fascination with apocalypses, dystopias, and futurist hells where power is total, where the only thing standing in the way of a bad guy with a gun is a good guy with a bigger gun — a good guy indistinguishable in practice from the bad guy. If that’s his reasoned opinion about Burnham’s dream, then why did he write a book warning of its possibility? In 1984, dystopianism has arisen whole — “expanded” and “crystallising” — and conquered the world in just the forty years since the end of the Nazi empire, and apparently it seems set to last, a boot stamping on a human face, forever. But it won’t and can’t. The only possibility was that Orwell was building a Burnham world precisely in order to contradict him by going further than even Burnham could. 1984 is not a warning, much less a prediction, but a parable. It doesn’t mean what it seems at first to mean, just as the parables of Jesus don’t mean what they seem at first to mean. I just finished teaching a class at Yale on utopian fiction. Selections ran from Plato and Thomas More to Kim Stanley Robinson and Ursula Le Guin, and students were asked to consider them not only as fictions but also as proposals. Then they wrote their own utopian projections. I insisted that what they wrote be utopian and not dystopian. Dystopia is too easy, and the models around them too plentiful. Utopia is harder. I asked them to ponder as deeply as they could what would really make for a better world. I think young people now are not attuned to such a way of thinking, on the whole. But maybe only a few young people ever have been. Anyway, their utopias were mostly set at some point in the future. Of course utopias have not always been set in the future; the sense that the future will not at all resemble the past really only comes when advancing technology changes the conditions of life and work within a single generation. To that generation it is apparent that, just as the present differs radically from the past, so will the future differ from the present. But by now, the future and utopia are — not identical but certainly interdependent. What were these smart, thoughtful young people thinking about? For most of them the problems that a utopian futurist might address were not particularly interesting: economic and social justice were assumed rather than theorized; societies were simple, transactions basic. Their utopias tended to be what Kim Stanley Robinson calls “pocket utopias”: perfect societies protected from the imperfect, or devastated, or desertified, or spoiled world around them. They were space stations, or had high walls, or were unfindable by outsiders, like Shangri-la. Few attempted to change the whole world, though we did read H. G. Wells’s fascinating attempt to do that in A Modern Utopia. What many of them were most concerned with was personal relations: how caring, loving, open, transparent human interactions, without dominance or greed or harm, could be fostered and maintained. Most had a cast of young to youngish people. Their utopias were a lot like Yale and its colleges. In more than one, the utopia conceived went out of existence suddenly at the end, as the human species graduated and set forth. They had, of course, written parables addressed to themselves. De te fabula. We bend over as far as we can for a taste of the stream of time, but always it flees from us, tantalizing; then it seems closer again, and we do it again, with the same result. “The advance of information technology epitomized by Google heralds the death of privacy for most people and shifts the world toward authoritarianism.” That’s Julian Assange. “If you want a vision of the future, imagine Washington-backed Google Glasses strapped onto vacant human faces — forever.” Assange sees the lords of Silicon Valley as going hand in glove with repressive autocracies and the pseudodemocracies that are merging with them; meanwhile they see a world made wealthy, safe, free, and playful through the same unfettered technology. The predictions of the technocrats shared with those of Burnham an insistence on how rapidly the world they imagine will come to be — and also how total, how successful the change, how completely those unable to be amalgamated into it will go to the wall. But Assange’s fears seem the obverse of the same counterfeit coin. What’s so funny? The story’s about us. The future is a story about the future. It isn’t necessary to be modest in our speculations and predictions. In fact immodesty is better than modesty. The human comedy of solemn or minatory predictions endlessly overturned and replaced by others, like a failing baker taking her unsold cakes from the case and replacing them with others, has poignancy; but what’s better is the artist’s consciousness of the parable nature of all such tellings, their potent superfluity. 1984 has long since lost its supposed predictive perspicuity, yet it has lost none of its force — which should be a clue to its real nature. It’s not the future, but it is what the predicting of the future should be: an ongoing, uncompletable enterprise of speaking lies to power, an enterprise in which failure is necessary to success.